By BayouCityGirl, November 22, 2004 in Going Up! Well, I was VERY annoyed at one of the stations that started playing xmas music the DAY AFTER Halloween! I was ready to throw the radio out of the room. In regards to 101.1, my daughter happened to be listening to the station during class and she said, "WTF??" outloud, when she explained to her teacher, he forgave her. On top of that usually I can find CUTE funny hilarious HOLIDAY Cards because my friends ALL do NOT celebrate Christmas! and well Walmart/Target left me UNIMPRESSED! Even Hallmark doesn't have a big selection. Where do I have to go for Holiday cards? I am trying to send out gifts/cards as soon as possible so it can get to my friends on time. I think this year I am going to Randalls for the Holiday Cards that the M.D. Anderson kids drew/painted. Much better looking and money goes to chairty. Some day maybe this whole "holiday" business will make sense to me. Christmas has turned into the holiday that dare not speak its name. At the Ebay store I work at, we put up the christmas tree on November first. I was disgusted. I had to push the turky out of the way to put the bloody thing up. my friends ALL do NOT celebrate Christmas! That's why I always get my ebay listings and greet everyone in regards to the HOLIDAYS, not just christmas. It's more even handed about that. If I might ask, then why were you putting up an Xmas tree on November 1? If your friends don't celebrate Christmas, why send them cards? I don't quite understand the meaning of a generic "holiday" with no context to it. Even if they don't celebrate Christmas, are they offended at the mention of it? I don't personally celebrate Ramadan, but it certainly doesn't bother me if others do. Not everyone celebrates Rosh Hashanah either. Both Christmas and New Year's Day are national holidays; whatever ones religion (or lack of same) this is a festive time of year. "The Holidays" acknowledges this fact without making perhaps unwelcome presumptions about others. Holiday gifts and cards for Grinches who don't celebrate does not make sense. Maybe we need a new card: "Get with the Program". Simple, my boss told me to. It was to try to get people into thinking about christmas when it came to selling their things on Ebay. APARTMENT developer the Hanover Companyappears to be the purchaser of the Kirby Court Apartments — or at least a portion of it. A chunk of the 1949 garden apartment complex, which faces Steel St. west of Kirby, directly across from Whole Foods Market, is outlined in avariance applicationsubmitted to the city by Hanover for what the company is calling theHanover River Oaks. The property earmarked for the development extends halfway (or 350 ft.) into the block between Kipling St. and Steel St. from Kirby Dr., but leaves out the Beck’s Prime drive-thru on the northeast corner. Let's hope they save those trees. I think all the commercial on W Alabama is included in this project. It's the same owner. The Dickey family, which has owned the land since Kirby and Westheimer were gravel roads! I thought The next phase of Westave was going to be built on that property? Wow that comment section on swamplot is complete trash lol. The only thing that I agree with is the Oaks. As far as the buildings go. I've walked this area a lot and those buildings are old, but in a terrible way. They have not aged well at all. They don't really have anything architecturally significant in anyway and neither are the commercial buildings flanking Kirby St. This is once again outrage for the sake of outrage and for the sake of not changing anything! Not to mention the sidewalks and streets in this area are complete garbage. The conclusion is that the only thing of value are the oaks and because of their age and extension over the road, and beauty they will be kept. Not to mention I hate the arrogance of the nameless "attorney" who thinks just because he is an "attorney" he will throw the book at Hanover. Honestly out of anyone that could develop this area I think Hanover is a pretty good one to trust. I also love the idiotic argument about Hanover not liking retail xD pfft Wow that person obviously hasn't been to Rice Village. This.. Wasn't West Ave Phase III with the office building and what not supposed to be built on this parcel? Is it safe to assume this will be a high rise? Given Hanover's luxury brand of apartments, it makes sense they would pick up the "River Oaks" moniker. I have to wonder how much more luxury multifamily Houston can absorb. There is a lot of luxury inventory that has yet to be delivered. Wow! You are right about those ridiculous comments on Swamplot! Those apartments haven't had a penny spent on them in years. And the family that is selling the property likely had many offers and choose the one that would best redevelop the site, as they still own about 30-40 acres on Kirby. We need the density, and the increased tax base. And IMHO, Hanover does some pretty handsome projects. There is already a Hanover River Oaks... This would need to be called something else. The apartment tower the Hanover Company is planning to replace the northeastern chunk of the Kirby Court Apartments on Steel St. and a few surrounding properties will defer to a range of cuisines. Sure it’ll be directly across the street from the Whole Foods Market on Kirby Dr. But it’s also leaving alone the property on the corner of Kirby and Kipling St., where Becks Prime will continue to pump out burgers to customers passing through its drive-thru. If that bit of culinary contrast doesn’t impress, wait for the building to be finished: According to documents submitted to the city for the variance the developer is seeking, the ground floor of the 370-unit Hanover River Oaks apartment complex will have lease space for restaurants. Remember that not all "luxury" apartments are created equal! I mean there are suburban apartments that now get the distinction of "luxury". Sadly it's a term that has become something you slap onto a marketing brochure to make it more marketable/more appealing. A lot of these new "luxury" apartments or mid-rises aren't for the super fabulously wealthy. Sure upper middle class and and lower upper class, but its not "luxury" like you imagine. In fact many of these places being built advertise amenities that are pretty standard in Houston from fitness clubs, to theaters, and the obligatory swimming pool. You do have a valid point though, but lets remember what Kirby street in general is trying to become or wants to be. It wants to be the richy rich street of Houston and is in a most affluent part of town in a district that is very much concerned about it's own image. Perfect! Like I said before, Hanover is pretty responsible and is one of the only developers in Houston that sorta gets Urban development. Don't get me wrong they still have a long way to go to really learn and adapt to the changing market, but in our borderline on the fence of suburbanism and urbanism they at least more reflect the changing attitudes of what the city wants to become. More details on the development.. The plants were submitted Monday. The company has told the city the building will have 370 units, including 187 studios and one bedrooms, 133 two bedrooms, and 50 three bedroom apartments. 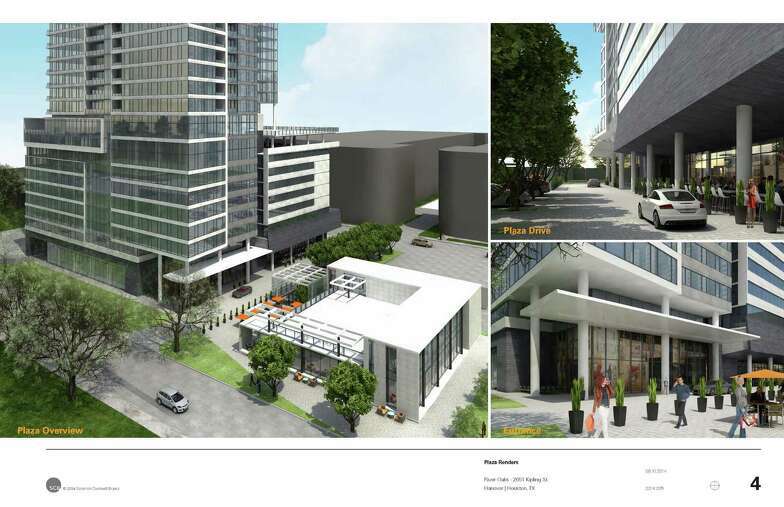 Restaurants are planned for the ground floor, and amenities on the 9th floor. 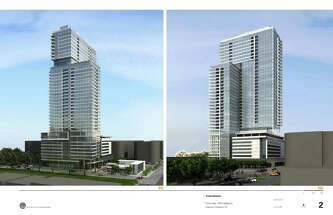 I hope the design complements 2727 Kirby well..
What makes the chron think this will be a highrise? What indications are there? the chron? ive only seen Swamplot and ABC report on it. how big is the property The Hanover Southampton Phase II complex is on? Phase one is about the same number of units as this but its on 4.5 acres. this property is only 1.65 acres, and over 370 units, vs the 12 story Hanover Southampton Phase II with 207(?) units. it only makes sense it would be a high-rise. i assume the garage will be 8 stories, with the amenity deck on top of the garage. hopefully the garage is wrapped in units a la the Sovereign or the planned 28 story Marquette tower. Hanover Post Oak is 29 stories/355 units on 1.2 acres..
Google says the apartment address is 2612 Steel St. but there are no records of it. I'm trying to figure out how much land they bought for this. It looks like this would not be any taller than 12, 15 stories max by looking at bing maps. Actually, Hanover sold that property to AMLI, so the name is once again available. Sarnoff's column has a nice big white space. What do you suppose was supposed to go in there? Wow, hanover does not dissapoint! Holy hell urb, thanks! Any full tower renderings or an official floor count? Just saw the second(?) or updated Chron article.. It could rise over 30 stories! oh my... it seems as though hanover, is stealing a few pages away from midway cos. very modern, sleek and cool! holy bejesus! are you kidding us urbannizer! Figures they'd put it behind a paywall. It's going to be a nice building, but it will completely obscure West Ave.
just copy and paste the link into a google search bar and click the link when it pops up to view the full article.. heres one more rendering from the article. any idea which side faces Kirby? edit.. i count 38 stories! after seeing the renderings/plans Hanover has, im glad this site didnt turn into West Ave Phase III, lol. WOW Hanover is quickly becoming my favorite developer with these towers they are throwing up. This one, the one at BLVD Place, the one on Montrose, and even the 12 story apartment building in the village. Im very impressed, Its nice to see a developer build a high-rise instead of the 5 story wrap that every one else is throwing up. I hope they still plan on building their condo high rise at BLVD Place. It would also be nice if they build a tower downtown. Im pretty sure that I read, a few months back, that they were looking at building a high rise downtown to take advantage of the incentives the city is offering. does that portion that juts out look to anyone else like a fantastic place for entertaining? obviously the pool is on the 9th floor, but one would think they would utilize that space/rooftop deck on the 30th floor for something. it even looks like there will be more amenities up there given the 2 story glass facade without balconies at that level on the left image. 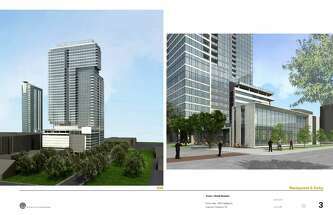 maybe they will go the Market Square Tower route and have 2 pools? whatever they do, that space will have spectacular views and be about even with the top floor of 2727 Kirby. I really like this tower's design. I hope you're right about them looking to build downtown. I'm still waiting for downtown to get a new condo high rise tower. I wouldn't mind this exact tower downtown, hopefully they follow the Skyhouse trend. That is fantastic. How could the neighbors complain about that? Look at all the green space. Incredible. Kirby will look completely different in the next 3 years. Wow. Looks like the gray buildings are west ave, so that should tell us the building orientation. In the first picture, the little building (which looks to me like the becks prime that's already thee) is facing kirby. Holy cow though I was not expecting this! I'm very impressed. This is big step in the right direction for this area. Imagine this and The Collection getting built! Lots of cool stuff here. Very attractive design. So is Kirby going to become the inner-loop version of Post Oak? Kirby is the center between the Galleria / Uptown and Downtown. I think a W or Ritz would be great in this area too... It is exciting to see this street absolultely take off. What can we do to get someone to buy that Wells Fargo @ Kipling & Kirby and re-development THAT? Ugh.